Are weight loss, blood vessel-dilating products being used in the peloton? Following a warning by German anti-doping specialist Mario Thevis that up to 100 variants of EPO may exist without a current test, De Telegraaf today writes that the substance AICAR has been in use in the peloton for some time. It quotes several unnamed sources as saying that it is being utilised by riders who wish to benefit from its ability to decrease body weight while also dilating blood vessels. UCI President Pat McQuaid has acknowledged to the newspaper that AICAR use is currently difficult to prove, but that WADA is aware of it and efforts are being made to perfect a test. The substance first made the news in 2009 when the-then AFLD director Pierre Bordry said that he believed it was in use and that some riders were looking unnaturally thin to him. One of the most important determinants of success in cycling is power to weight, particularly in the mountains, and so any substance which can help riders lose body fat has advantages. Research relating to this first surfaced back in 2008, when Professor Ron Evans of La Jolla, California was doing research to find a cure for the increasing epidemic of obesity and diabetes. He found a substance that would trick the cells in thinking they exercised a lot while in fact they had been mostly idle. The mice ran faster, had better endurance and burnt fat. When the mice were actually following a training regime the results almost doubled. The media dubbed it the “coach-potato drug”, the miracle cure to obesity and diabetes for people who were unable to exercise. The words AICAR and GW1516, the substances tested by Evans, buzzed around body building and fitness messageboards. By training and taking the drug, the suggestion was that you could increase your output. If athlete A was training without addition of the drugs and athlete B took the drugs next to training, the latter would have more strength and endurance with the same time investment in training. Or at least, that was the theory, since the tests by Evans were performed only in mice and no proper study has been done in humans. Professor Evans realized too that this could be an ideal drug for endurance sports, like cycling, also because it burns fat, and informed WADA about it. The World Doping Authorization included it into their Prohibited List. That wasn’t the end of the matter. In 2009, after the Tour de France, the French anti-doping organization AFLD searched bins and reportedly found remnants of drugs that were “unlicensed”: third generation EPO, also known as Hematide, and AICAR. “These are products that shouldn’t be found around people who are supposed to be in good health,” AFLD scientific adviser Michel Rieu said then. The AFLD wanted to run more tests on the 2009 urine samples from the Tour but UCI held these samples and, according to Le Monde on July 28th, didn’t grant permission for re-analysis. 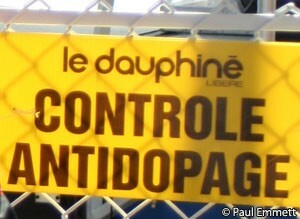 Unfortunately for WADA, there are problems. Testing for AICAR is very tricky. It requires equipment that only advanced research labs have. Moreover, AICAR is a substance which closely resembles a protein that is naturally present in the body, as is the case for example for testosterone or EPO. Every substance entering a human body passes through the liver, resulting in so-called metabolites and these can be found in urine. The level of that protein’s traces in a person’s urine is very variable and depends on gender, level of activity, type of exercise and more. It is therefore difficult to determine a level that is normal and use that as a reference value. In other words, for synthetic substances like clenbuterol which don’t have a natural counterpart, the threshold would be zero since the body simply does not produce it itself. For AICAR, this threshold would be variable, complicating things. GW1516 ultimately never reached the market because clinical trials stopped in Phase II, for reasons unknown. It is only available to biomedical research labs. AICAR is a substance which is still in the testing phase for several applications but can be bought online. From an anti-doping point of view, there is one positive thing about AICAR: it’s very expensive to buy. The experiments Professor Evans ran involved a dose of 500mg per kilo body weight for four weeks. That’s the time the experiment with mice took. A gram costs between $80 and $100 so, theoretically doses for humans would costs several hundred dollars. The French paper Libération quotes figures of half a million euro for a treatment with AICAR in a lab in Vienna. But again, there is no research whatsoever to show how much and how long you need to take it to get an effect, so figures are hard to determine. Herman Ram adds. “We do think AICAR is a bit of a hype. It’s far too expensive and there are other things on the market that do the same, and better. And again it’s dangerous because it’s never been tested on humans.” But the latter point doesn’t deter the black market in doping, with a history of untested products being used. Hype or not, AICAR is out there and apparently money isn’t deterring the ones wishing to try it. High profile riders earn lots and, secondly, with the molecular structure mapped out, it’s theoretically possible to go to a commercial lab that doesn’t have any ethical obligations against the use of doping and have it reproduced illegally. The drugs they make in bulk are of reasonable quality, and much cheaper than the originals by pharmaceutical companies Schering-Plough and GlaxoSmithKline. So, while these substances AICAR and GW1516 are on the WADA prohibited list 2012 and use of them, in any quantity, is therefore forbidden, it’s difficult to trace them because of the costs of doing so and because of the endogenous similarity to AICAR. But, according to researchers, there may be another problem looming for those who try to beat dopers and it’s called Telmisartan. Telmisartan is a prescription drug for high blood pressure. It’s accepted by the U.S. Food and Drug Administration and not on the WADA list, nor is the class of drugs to which it belongs. Only specifically named substances and substances that are not approved by government regulatory bodies are on that list. Telmisartan is neither and, according to recent research by Fabian Sanchis Gomar of the University of Valencia, Spain, it has virtually the same specifics as AICAR and GW1516. It also enhances running ability in mice if they are completely untrained. With training, endurance increases, fat is burnt and recovery is faster as there is less lactic acid formation. Both WADA and the Dutch anti-doping authority know of Telmisartan but they say they are not convinced of the effects reported by the study by Sanchis-Gomar. “Recent scientific research does not seem to validate that claim,” WADA spokesmen O’Rorke insisted. Meanwhile, the substance has been found near cycling. During the same Tour de France raid in 2009 the AFLD-researchers found packages of Telmisartan. This was before research claimed similar characteristics as AICAR, and AFLD therefore couldn’t really explain its presence in a cycling-related environment. Every chemist has access to Telmisartan and because it’s not experimental anymore, it is therefore widely available. If AICAR is on WADA’s forbidden list and Telmisartan - which might have the same effects - isn’t, the latter might be a way to escape detection. More research is needed in relation to these substances, particularly as those seeking to gain unfair advantage will always try to cut corners and gain advantage over WADA and the rest of the peloton.